HALBAN Worldwide Oman is renowned for its ophiolite rocks. 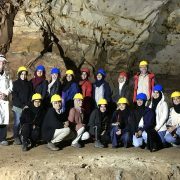 To study their composition, age and possible impacts on climate change, a large group of international geoscientists from various universities around the globe have been conducting the Oman Drilling Project. 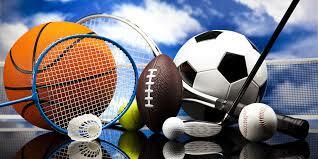 GUtech is on-site partner during the three year project. “The Oman Drilling Project will sample the whole ophiolite sequence in Oman, from the crust through to upper mantle, in a series of boreholes. Data collection includes analysis of rock core, geophysical logging, fluid sampling, hydrological measurements and microbiological sampling,” said Prof. Dr. Michaela Bernecker, Head of the Department of Applied Geosciences at GUtech. 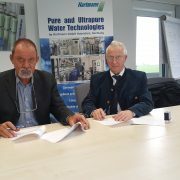 “We will develop research related with the aims and using the core samples or other data such as water and geophysical data of the project. 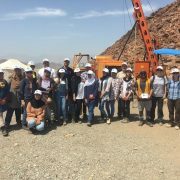 Four female GUtech geosciences students have been involved on site recently,” said Prof. Ana Jesus a Petrologist from GUtech. 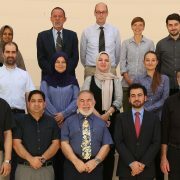 Prof. Ana and Prof. Dr Ekkehard Holzbecher, Hydrologist of the Department of Applied Geosciences at GUtech are members of the scientific team and the main persons for liaison for student involvement. GUtech students were involved in the processes that are necessary for the curation of the rocks. “It was a great opportunity for them to learn these procedures within an international team”, said Dr. Ana. The four GUtech students, Maisa Al Busaidi, Nidhal Al Jahwari, Maria Al Balushi and Zahra Al Lawati worked on a drill hole in Wadi Gideah close to Ibra. “They accompanied the core flow, which are all the steps since the core comes from underground until it is finally packed for shipping involving, washing, measuring, photographing, curating, labelling, sketch and logging having participated directly on most of those operations as well,” said Prof. Ana. 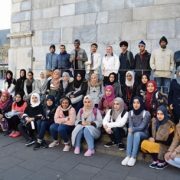 The project leader of the Oman Drilling Project, a renowned geoscientist Prof. Dr. Peter Kelemen, Head of the Earth and Environmental Science Programme at Columbia University took the GUtech students to a field-trip. He showed them the so-called core flow on site and the local geology while discussing scientific questions. 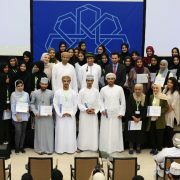 In addition, scientists from other universities in the region and worldwide participate in the project, that was launched this year and is scheduled to take another two years. To finalize the full geological and geophysical characterisation of the drill cores that were obtained this winter in Oman, Prof. Ana will travel to Japan and work on board the Chikyu ship with an international scientific team end of this year. More than 40 natural scientists from different continents and a broad spectrum of disciplines will use these new datasets to address a diverse range of scientific questions relating to the formation, hydrothermal alteration and biotic and abiotic weathering of oceanic lithosphere.